Kitchen & Bath Designer, Julia Enriquez of Astro, recently completed a remodel for a couple planning to add an extension to their home for their new kitchen. The couple live in a beautiful historic home in Rockcliffe Park, and were looking for a space they could relax, entertain and enjoy each other’s company. The couple sought out Julia and got into planning their kitchen remodel. The concept for this kitchen was crafted for those who crave the culture and allure of the past. Stepping into this historic home, there were beautiful antique pieces and unique artwork all around. The couple knew they wanted to keep with this theme, so a classic kitchen was designed for their taste. 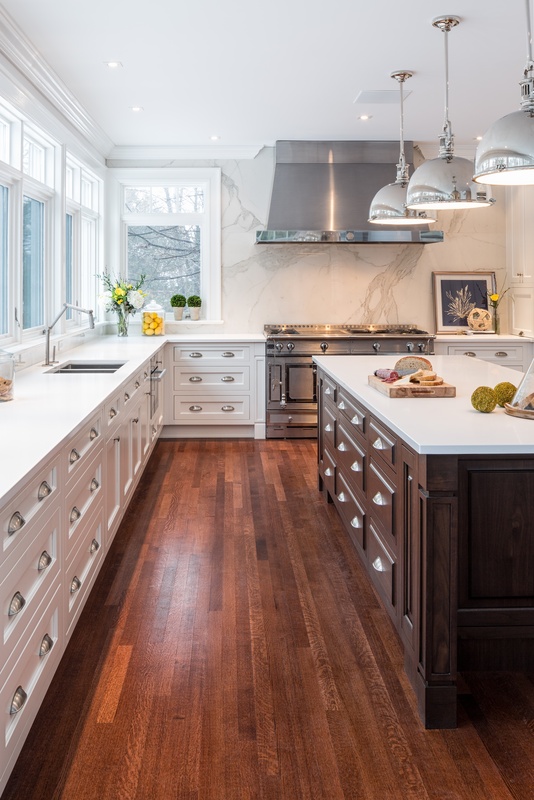 The traditional framed painted cabinets by Downsview Cabinetry (via Astro) and a walnut wood island finish were inspired by the old world beautiful La Cornue range. This range was the focus of the kitchen, and the materials were chosen around it. Keeping it simple in colour and materials, yet adding traditional details in the design was the overall theme of this kitchen. The porcelain slabs of Calcutta chosen for the backsplash used against the range draw your attention to the centre of the kitchen. Leaving the wall bare of uppers and a Calcutta backsplash proved to be a stunning statement against the show-stopping hood fan. Just like any remodel, there were some challenges. In this case, the wall of windows did not allow for any upper storage along there. However, it added the beauty of the natural outdoors into the space. Because of this, floor-to-ceiling cabinets on the opposite wall were added. This feature is proving to be a trend in recent kitchen projects, to add storage where it’s been reduced. 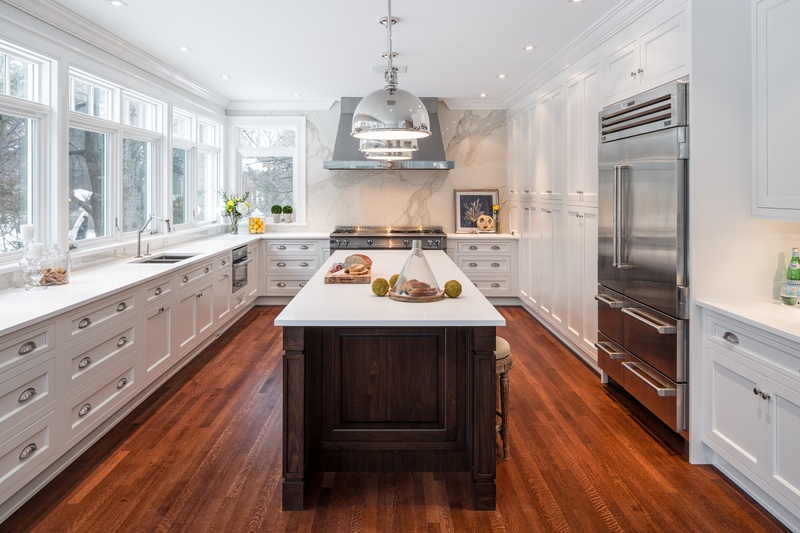 The long centre island provides a beautiful slab of counter space for cooking and entertaining, as well as storage and seating. 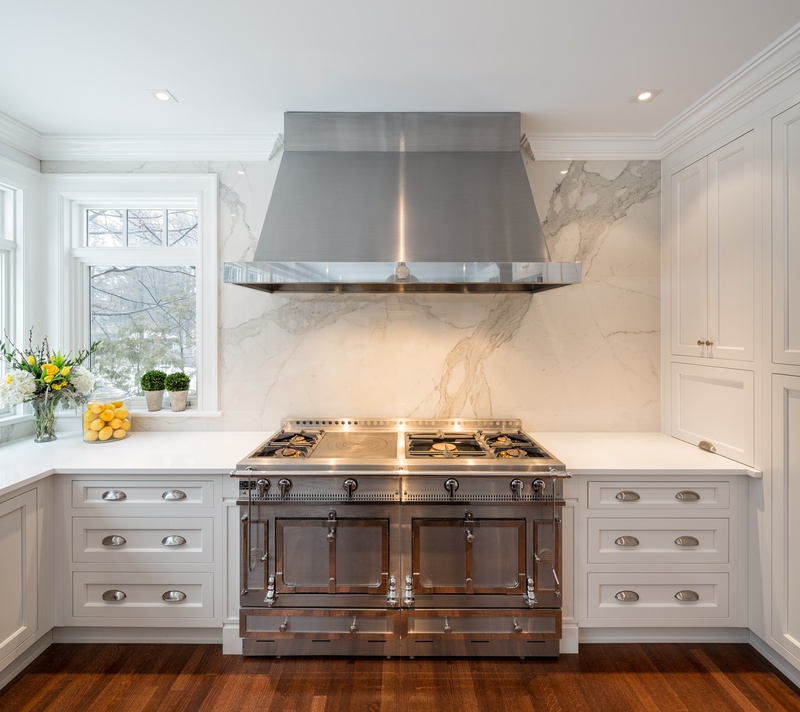 The traditional details on this Downsview island, specifically the legs are also part of the elegant design of this kitchen. 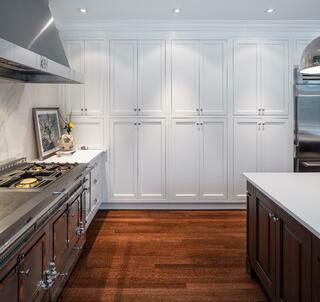 This kitchen is traditional in detail, however the clean lines allow for a more refined balance. A sense of authenticity is instantly cultivated in the subtle elegant touches and refined details of the new traditional design. A shout out goes to our designer, Julia Enriquez, our design technicians and installers for coming together in executing a beautiful design for our clients to enjoy! Ready to start planning your dream space, book with one of our designer's for your complimentary in-store design consultation. See the full Kitchen Gallery Here.